do you want to triout foursquare for real estate? I’ve wanted to write this post for awhile. I’ve been stirred by some great posts as of late on location based social media tools by Wayne Sutton and Maya Paveza. Maya’s 8 Rules for FourSquare are fantastic and as the Business Development/Marketing Strategist for TriOut, Wayne’s blog provides some amazing posts on the topic. I had a great discussion at our REBCRDU planning session last week and another great conversation this morning while leading a discussion on online marketing at our CBHPW Falls of Neuse office. There has been a lot of chatter as of late surrounding location based tools and real estate, especially with the recent launch of Facebook Places. Are these tools good for real estate agents? Or are they bad? I think I can argue both sides of the coin. Let me be completely transparent. I enjoy TriOut and FourSquare. I love getting my discounts from local stores for checking in and I love getting tips from others who have visited other close by locations. When I started using these apps, I was checking in everywhere, my workplace, my local grocery store, the coffee shop, the dog park. Then one evening my friend Brad Hudson texted me and said that he saw I was at the dog park again on FourSquare. He added, you better be careful. You are a female and letting everyone know where you are on a regular basis. I laughed it off at first as I only accepted friend requests from people I actually knew in real life. However, he raised a good point. You can see a previous post I wrote on my concerns of real estate agents and their safety with location based social applications. With all of these concerns is there a use for location based tools and real estate? Trends and statistics back up the fact that consumers are looking for hyper local content. On one side, I think there are huge benefits as far as truly building yourself as a local community expert. Using FourSquare or TriOut to check into local businesses in your community can help solidify your expertise in the area not only in real life by learning everything you can about your community, but also by showcasing those visits and sharing tips in a social networking world. In can also help you connect with others that frequent the same community spots as you. On the other side, perception is everything. Most real estate associates work 7 days a week and long hours most days. It is not odd in their world to spend 30 minutes at the mall in the middle of the day on Monday when they have a free moment since they spent all day Saturday and Sunday showing and staging properties. Yet, most of our real estate clients live in a 9-5 world and would be shocked and even upset to see their REALTOR checking in to a store in the middle of the day when they should be trying to sell their home. There is even a new application called 4Mapper that, once you give it permission to link with your FourSquare account, will map out all of the locations you have checked into. Again, a great application to showcase yourself as a local community expert, not so great for those midday errands if you’re a real estate agent. And the new Facebook Places feature? There are plenty of great posts out there by experts giving you the download on this new feature, so I won’t delve into that. What do I want the real estate professional to remember? Every time you use Facebook Places to check into a location, it posts to your wall and thus into the feeds of all of your Facebook friends. Remember, perception is everything. So how do I use TriOut and FourSquare? I check-in to places that I feel comfortable with others knowing about; an office, a restaurant meeting friends, cool local community businesses, a networking event, an event or a place where others might be interested in or see value. I add tips to local restaurants and cool stores I like and post photos when I can. I post places of interest to Twitter, never to Facebook, as I personally don’t feel I should post to my profile that many times a day. And I don’t check in at my local Target anymore or my local coffee shop… and definitely not the dog park. networking in the first place. I really feel that it can serve huge benefits to the Realtor who intends to make a presence as the “local expert” and can help people grow their SOI by creating relationships with people who share common interests. Adding tips adds value and starts a “reciprocation echo” which could bounce back from the owner, manager, bartender, etc. and help you in the long run. I think we’re just on the cutting edge of major acceptance of location based tracking tools and as the old saying goes, “if you can’t beat ’em, join ’em.” many people who eschewed Facebook and Twitter a few years ago now have friends and followers in the hundred if not thousands. Before you know it, they’ll be logging in to update their whereabouts. Thanks for the comments Sean. I wish you were coming to rebcrdu here in Raleigh this week. We are going to have a panel discussion on location based services. I may have a follow up post to write! Nice post and interesting feedback on using location based services. Note when using TriOut you can have your entire profile set to private and only your approved friends can see your check-ins. Agree it is part about perception. Thanks for taking the time to read my post Wayne. I personally am a huge TriOut fan and use it much more than FourSquare. Can’t wait to tell more people about it and discuss the benefits on Friday at rebcrdu. Looking forward to seeing you and hearing you speak. 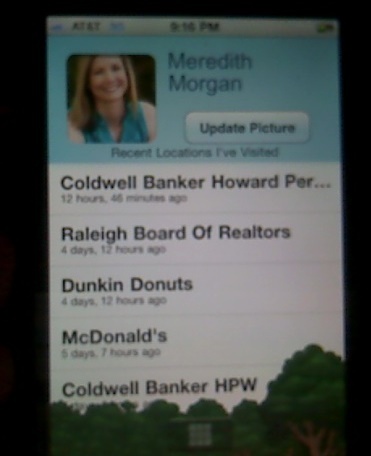 « foursquare and real estate?!? !